The novel way to protect your tablet when not in use. iPads are one of the most sensitive gadgets and they need utmost care and maintenance. Buy the Keep It Real iPad Protective Pouches online and keep your iPad safe from dust and scratches while you carry them everywhere. Made from high quality imitated PU leather, these Keep It Real iPad Protective Pouches are the best way to protect your iPads while you are on the go. The pouch features a soft microfiber lining that not only provides a cushioned space for the iPad but is also effective in cleaning the iPad surface when you slide it in and out of the pouch. With no zippers or buttons around, there is no way you could damage your iPad with this cool pouch. Your expensive iPad maybe as thin as a wafer but bulky pouches can spoil its uber-cool looks. But with this cleverly designed Keep It Real iPad Protective Pouches that are ultra-thin with minimal bulkiness, you will never fail to impressive all around you. Don’t forget to purchase this unique pouch when you buy an iPad as a birthday present for her, it will make your gift look complete. 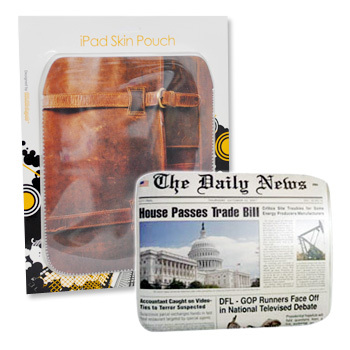 It comes in two trendy designs, leather satchel or newspaper design. Choose one or purchase both and carry it in style matching your attire. Product dimensions: 0.7 (H) x 26 (W) x 33 (D) cm / 0.2 (H) x 10.2 (W) x 12.9 (D) inches.